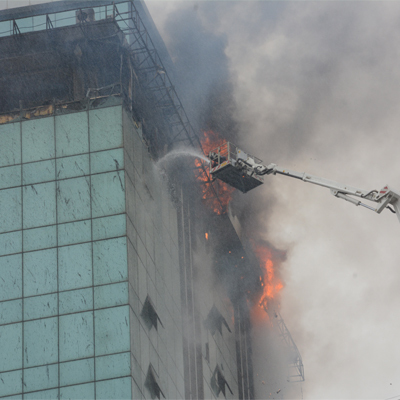 A major fire broke out at a 24-storey high-rise building in central Kolkata area on 02nd September 2014. According to sources, the fire broke out around 9 a.m. between the 12th and 15th floors of Chatterjee International which is the fifth tallest building in Kolkata. People trapped inside the building were rescued by the fire department and there is no news of any casualty and the cause of the fire Very few people were in the building as the fire broke out before the office hours. Six fire engines had rushed to the spot along with two hydraulic ladders; the fire brigade official had been struggling to put out the fire as the smoke remains trapped on the floor in absence of exhausts in the building. The building is situated on the busy Chowringhee road, which is one of the arterial roads in Kolkata.The area has been cordoned off to conduct the firefighting operations in the busy area. The cause of fire or extent of damage was yet to be ascertained, police said.